Most lawnmowers are heavy, a hassle, and hard to push. If you aren’t using an electric mower, you’re having to deal with gas refills, oil changes, and spark plug problems. If you’re wanting to get in better shape or do your part to help the environment, a reel mower may just be a great pick for you. The recurring costs are almost zero, maintenance is reduced to an occasional sharpening, and there are no harmful emissions. Reel mowers do come in a variety of options and it can be hard to choose which one suits you best – that’s what we’re here for. Below, we break down all of the options so that we can find the best reel mower for your specific needs. Let’s get started with our top overall pick. American Lawn Mower Company has built a machine that is a powerhouse in the reel mower market without being an option that will break the bank. This mower comes with an 18-inch cut diameter and 5 separate blades to snip the grass off clean. The 5 blades are important since the more blades your reel mower has, the less often you’ll need to sharpen it. The American Lawn Mower Company’s reel mower comes with 7 adjustable height options ranging from 1/2″ to 2-1/4″. This should allow for plenty of options to customize how you want your grass to look and the option for 1/2″ is perfect for anyone who really wants to trim down the yard. This mower is one of the stronger options due to the five blades and large cut diameter, but it does weigh a tad more than usual. It clocks in at 29 pounds. Overall, this is a great mower for those who want a big and powerful machine without breaking the bank. It’s our top overall pick. The Fiskars is the king of reel mowers, but its bells and whistles come at a price. The Fiskars comes with an 18-inch cut diameter, which is big but nothing too special. What is special about this mower, though, are two technologies that Fiskars calls InertiaDrive and StaySharp. InertiaDrive helps the mower glide through thick, tall, or tough grass without you having to strain as much as with other mowers. Fiskars claims that their mower can be up to 60% easier to push than other mowers and buyers do agree that this mower can chomp through the hard-to-cut stuff. StaySharp is another one of Fiskars’s technology that is unique to this mower. StaySharp decreases unnecessary contact between the blades, ensuring that your mower doesn’t need to be sharpened as often as other options. This mower comes with 7 height adjustment options ranging from 1″ to 4″ and will allow you to select the direction of your grass discharge. You can either shoot the grass out the front of the mower or shoot it behind and down like most other reel mowers. The Fiskars weighs in at 52 pounds, so it’s the heaviest item on our list. It’s even heavier than some electric lawnmowers, but the Fiskars does come with a lifetime warranty if you’re prone to breaking things. This is a great mower for someone who wants the absolute highest quality and doesn’t mind paying a little more for it. The lifetime warranty ensures that this mower should pay for itself over time. American Lawn Mower Company makes the list again with a mower that is more suited to smaller yards, budget buyers, or those looking to get a very lightweight option. This mower comes with 4 blades instead of the 5 blades included with most mowers on this list, so this option will dull a bit faster and will have a little more trouble on thicker lawns. The mower here includes 7 height adjustment options ranging from 1/2″ to 1-3/4″, so it’s allows you to customize how you want your yard to look. There’s a reason this mower doesn’t have height options for more than 1-3/4″ though: it’s worth repeating that this mower will have trouble in taller or thicker grass. American Lawn Mower Company’s 14-inch mower is the lightest mower on this list, coming in at just 20 pounds. It’s a good pick if you are afraid of having to push a heavier mower or want something that will glide over your shorter grass. This mower comes with a 1-year warranty and is the most cost-effective buy on the list. 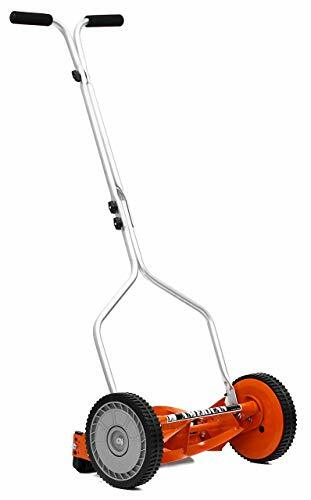 This reel mower is one of the best options for those who want a great budget purchase or anyone who wants a very light reel mower. 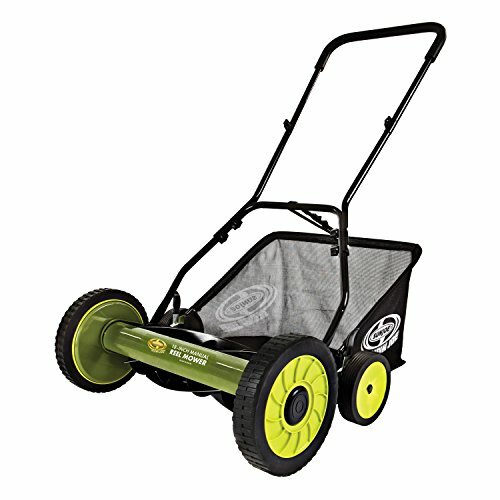 Sun Joe’s mower is a great option for those who want to bag grass with their reel mowers. This mower has an 18-inch cut diameter and comes with 5 blades, but some buyers mention that it can be a little tough to push through grass with this one. The Sun Joe has a feature that is unique on this list though: it comes with the attachment where you can bag your grass and deposit it elsewhere. The bag is a bit on the small side in comparison to usual bagging options, but it can be helpful to have anyways. The bag can also be unattached to discharge your grass behind the mower. The Sun Joe comes with 9 adjustable height options ranging from 1-2/5″ to 2-1/2″. It’s nice to have nine options, but this is a smaller absolute range than other mowers offer. You’ll end up with a mower that’s not too tough to handle at just 28 pounds, so this isn’t a bad pick for those looking for a smaller mower. Sun Joe includes a 2-year warranty on their mower. This is a quality mower best suited for you if you’re wanting the option to bag your grass or if you’re looking for a more budget-friendly mower. The Great States mower is a solid option, but doesn’t offer much that other mowers don’t do better or for less money. This mower has a 16-inch cut diameter, which is a bit small for the price range this mower sits at. It does come with 5 blades so you won’t have to worry about sharpening or maintenance as much. The cutting height on this one ranges from 1/2″ to 1-3/4″ and there are 3 settings to change the height. One downside of this mower is that the handlebar itself (this is where you hold and push the mower from) is not adjustable. All other handles in the mowers we’ve reviewed are adjustable, so this seems like a common feature that the Great States mower is missing out on. For that reason, this mower may not be best for those who are very short or very tall. This mower is very light: it weighs in at only 22 pounds. It’s a good pick if you’re looking for an easy-to-push reel mower. The Great States mower includes a 1-year warranty. Overall, this mower’s biggest strength is that it’s lightweight, but it’s not too special for its price range. We recommend going with one of the other options on this list. 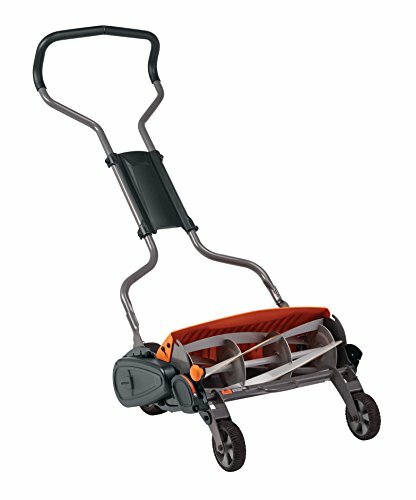 What Size Reel Mower is Best for My Yard? If you didn’t notice, reel mowers come in a wide range of sizes from 14 inches all the way to 18 inches – almost half a foot difference! Larger mowers are not always better though. If your yard has a lot of natural areas, koi ponds, raised gardens, turns, corners, or a lot of other things that will need to be mown around (like an in-ground fire pit), a larger mower may end up causing more trouble than it’s worth. Smaller mowers are always easier to maneuver and a lot lighter when you’re turning. Reel mowers are unlike almost all other lawnmowers in the fact that the maintenance required is next to none. Corded electric mowers are the only other mowers that require so little upkeep. Sometimes you will need to sharpen the blades with your reel and corded electric mowers, but not much else is required. If the grass you’re cutting is pretty thick, you may sometimes need to dislodge a bit of it inside your mower to make sure that the mower’s blades can continue revolving. Blades on reel mowers are made to last so you shouldn’t have to worry about the blades dulling on you within your first year if your grass isn’t too devilish. When you do need to sharpen your blades, you can buy an accessory kit, here. The biggest grievance most people have against reel mowers is their inability to cut things that aren’t grass. Reel mowers have a tough time going through sticks, branches, rocks, or other tough items. If your yard isn’t too tough to deal with then this won’t be an issue; toss a couple of twigs into your neighbor’s yard and all will be well. If your yard seems to grow rocks, we recommend going with a push mower. Do I need the front-discharge, rear-discharge, or bagging options? Discharging grass to the front of the mower will cut each blade of grass twice: once from the ground, the second time from inside the mower to grind up the grass. This works like mulching on a regular mower. Front discharge may require you to walk a bit slower as you’ll be cutting each blade of grass twice and it is a more time-consuming process, but the grass clippings will be able to biodegrade into the ground and aid future growth. Rear-discharging the grass is just what it sounds like: when the grass is cut, the mower shoots it out the back. 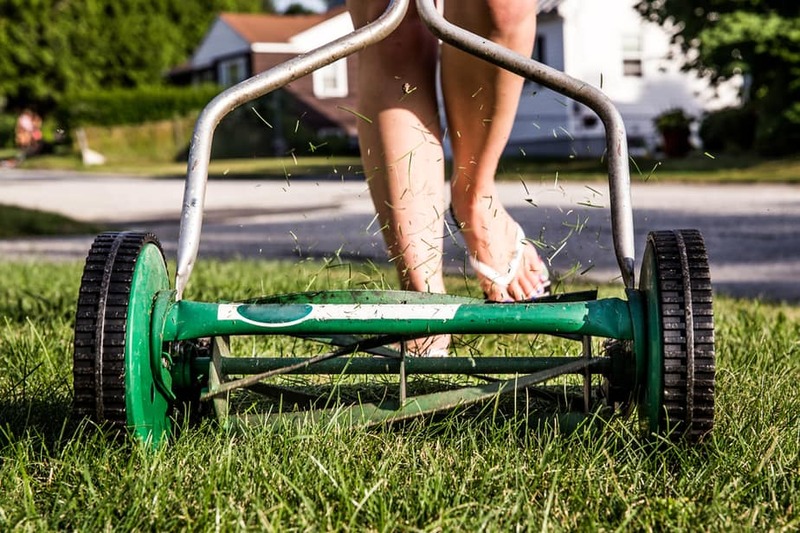 This can be the fastest way to cut the grass, but you will need to be prepared for your feet to get a little grassy. If you’re looking to cut your grass as fast as possible, we recommend going with the rear-discharge option. You may end up leaving some grass clippings in your yard, but you can either cut over those clippings again or allow them to degrade au naturale. If you want your cut grass to go back into the yard to nourish it, we recommend front-discharge. What options you need will depend on what your preferences are for how your yard looks and what you want to do with it. Not all options on this list include front-discharge, rear-discharge, or bagging options so if this is important to you, you will want to keep an eye out for which options do what. If you’re looking to purchase a bag for bagging your grass, most mowers on this list allow you to attach one. This bag will work for either of the American Lawn Mower Company mowers or the Great States mower. This bag will work on the Fiskars. The Sun Joe comes with its own bag. Great States was born when parent company American Lawn Mower Company wanted to make the world’s best mower for smaller yards. Great States and American Lawn Mowers strive to be the best in the business and responsible towards the environment – a mission they’ve been pursuing for over 120 years. Fiskars was founded all the way back in 1649 (and no, that’s not a typo). Fiskars started as an ironworks in a Finnish village by the same name. Since then, they have expanded their product line to make it easier for people to do the things they love. Thanks for reading our guide on the best reel mower! When it comes down to it, the best option for you is going to be the one that suits your unique needs best. Take note of the shape and size of your lawn to note whether you’ll want a larger mower or a smaller, more maneuverable one. Ask yourself what you want your yard to look like and how you want it cut – are options like front-discharge, rear-discharge, and bagging important? Lastly, take a look at your budget. We’ve reviewed lawnmowers from the high end picks to the most budget-friendly options, so there is surely something for everyone. 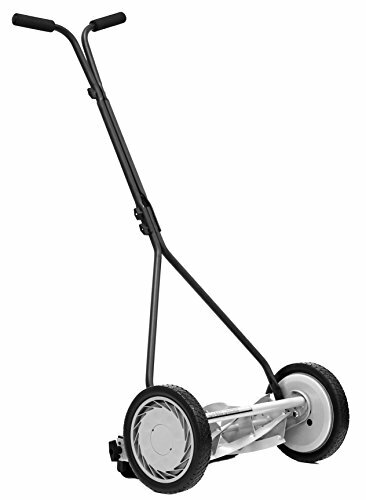 Our overall top pick is the American Lawn Mower Company 18-Inch. It provides a lot of strengths at its price point and doesn’t have any clear weaknesses. If you’re looking for a more budget-friendly buy, we recommend the American Lawn Mower Company 14-Inch or the Sun Joe 18-Inch. These options let you get a lot done while saving yourself a few bucks. When all is said and done, the best reel mower for your needs will be the one that can get your yard just how you like it, so don’t be afraid to take a little time looking around and being picky.